GEN Herbal Tick & Flea Control Shampoo is an improved formula of the existing Roots Herbal Flea & Tick Control Shampoo, with the addition of a pump for convenience. 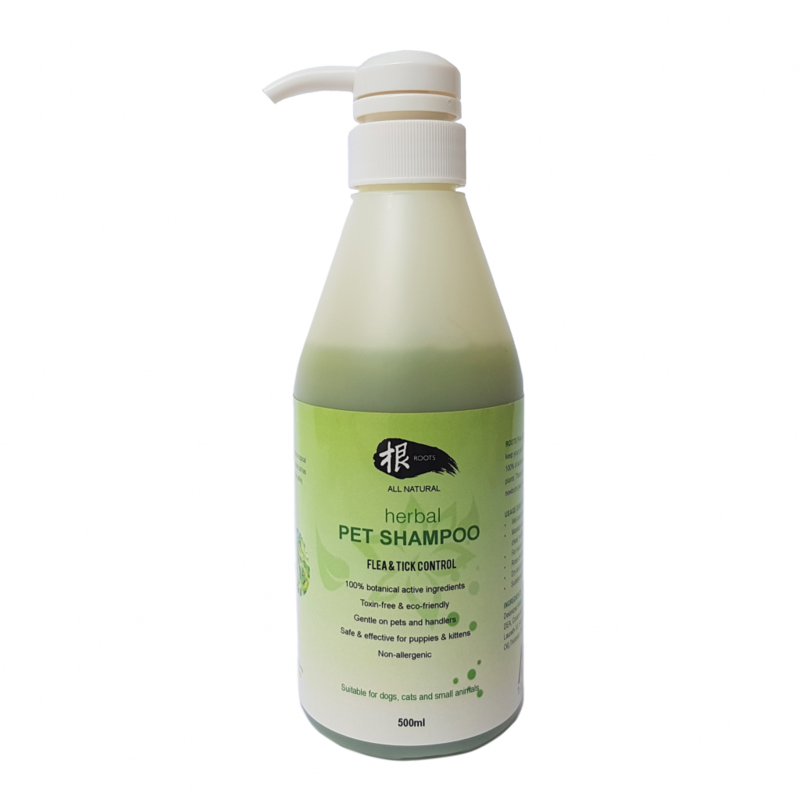 It is an all-natural herbal pet shampoo formulated with Sweetsop extracts and Neem oil to make it a natural way to keep your pets tick and flea free. 100% of the active ingredients are derived from plants with no toxic synthesized pesticides. It is gentle enough even for small and newly born pets, keeping your pets’s coat soft, smooth and shiny. Deionized Water, Sodium Cocoyl Alaninate, Sodium Methyl Cocoyl Taurate, Cocamide DEA, Cocamidopropyl Betaine, Propylene Glycol, Glycol Distearate, Cocamine MEA, Laureth-10, Sodium Chloride, Anonaine (Sugar Apple Extracts), Azadirachtin (Neem Oil), Triclosan, DMDM Hydantoin, Fragrance Oil. – Sweetsop (An ethno veterinary medicinal tropical plant. It is an effectie botanical insecticide and has been used to “safely” kill human hair lice for ages. Now it is time for lice’s relatives, ticks, to be rid off your beloved pets). – Neem oil (Extracted from the tropical Neem tree. It contains insecticidal properties that are non-toxic to mammals. Neem oil is also proven to be effective as a potent insect antifeedant and repellent. Neem tree is also known by several names including “village pharmacy”, “wonder tree” and “the veritable gold mine”).